24 April 2009, at 9:09a.m. GLOBAL - Supporting customers through the publication of relevant and practical technical literature is an important part of Aviagen’s technical service. 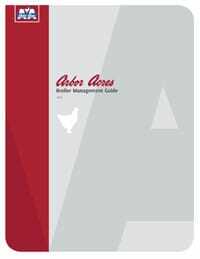 The new Arbor Acres broiler management manual is the latest offering from the technical team and provides customers with a comprehensive guide on all aspects of broiler production. The manual takes into account the changes in broiler management seen in recent years, as well as the continuing improvements in genetic performance of Arbor Acres products.